Sri Lankan President Maithripala Sirisena told President Duterte during a state dinner hosted by the Philip­pine leader in Malacañang Wednesday night. Sirisena said he is willing to emulate President Duterte’s relentless crack­down on illegal drugs and crimes to address the same problem in his home country. In his state visit to Manila, Sirisena acknowledged there has been a pro­liferation of illegal drugs in Sri Lanka and lauded Duterte’s strategy in fighting such menace. “The war against crime and drugs carried out by you is an example to the whole world and personally to me,” he said during the state dinner. The two leaders had earlier held bi­lateral talks in Malacañang and agreed to enhance cooperation on defense and military, education, agriculture and fish­eries, and tourism. They also agreed to explore other areas of cooperation such as migrant workers’ protection, disaster response, and maritime security. Duterte, speaking to reporters after the meeting with the Sri Lankan leader, said the Philippines considers Sri Lanka a “partner” in addressing illegal drug trafficking and human smuggling and other challenges. “We both recognized that the pro­liferation of illegal drugs is a threat to our nations and peoples and to the very fabric of [our] growing societies,” he said. “As we look back on our shared past, we look forward to a future of significant broadening and deepening of our ties; in trade and investments; defense and security; agriculture; tourism; educa­tion; culture; and people-to-people exchanges,” he said. “We nurture these seeds to ensure that generations after us will harvest the fruits of greater peace, progress and prosperity,” he said. Duterte said he was honored to have the first Sri Lankan President, serving as a head of state and government, visit the Philippines. He also recognized there was room for growth in the rela­tions between the countries. 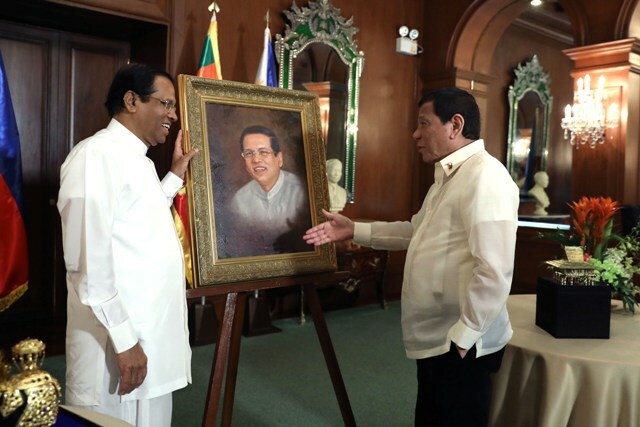 The Philippine leader said he con­siders President Sirisena as “a true friend of the Philippines.” He noted that Sirisena visited the country several times, including Metro Manila, Laguna, and Davao. His interests then were in agriculture. “In the last few years, our bilateral engagement has significantly broad­ened. There, however, remains much room for growth,” he said. “Today let us provide the much-needed impetus and direction to signifi­cantly expand and deepen cooperation between our two countries,” he added. “On this his return trip today from the ‘Pearl of the Indian Ocean’ to the ‘Pearl of the Orient Seas,’ President Sirisena’s interests have clearly broad­ened, and his appreciation for the im­portance of Philippines-Sri Lanka ties greatly heightened,” he said. Sirisena said he was “very happy” with his meeting with the Philippine leader to advance the strengthening of relations between the two countries. “Therefore, on behalf of the people and the Government of Sri Lanka, I take this opportunity to extend our heartfelt appreciation to Your Excellency,” he told Duterte. 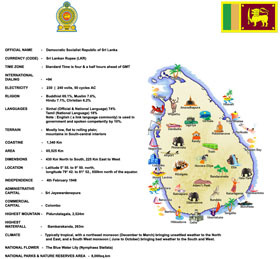 Meanwhile, Sirisena endorsed the establishment of a Philippine embassy in Sri Lanka as the two nations moved to reinvigorate economic and security cooperation. “The relationship between Sri Lanka and Philippines is a longstanding friendship,” he said. “In order to strengthen the bilateral relations between the two countries, establishing a Philippine embassy in Sri Lanka would be highly instrumen­tal. Therefore, your marking a plot of land for the Philippines’ embassy in Sri Lanka would be – necessary action will be taken expeditiously,” he said. At present, the Philippines has an honorary consulate in Colombo, Sri Lanka under the supervision of the Philippine Embassy in Dhaka, Bangladesh.